Clipped garlic bulbs ready for sorting and storing. Here’s what we’re doing these hot, rainy afternoons (and a couple of rainy mornings) – taking our cured garlic out of the netting lining the barn walls, and preparing it for storage. It’s been curing (drying down) for about four weeks. In the process we are selecting which bulbs to keep to replant his fall. Calvin figured we’ve grown enough garlic for each person to eat one whole bulb a week. i thought that was a lot, so I recalculated in the cool of the office. To my surprise the answer is closer to two whole bulbs each per week! We have checklists for the people trimming garlic, so i thought I’d share those with you, so you can be a fly on our barn wall, or in case you grow garlic too,and wonder how other growers deal with the bounty. A pleasant sit-down, social task. Handle the bulbs gently so as not to bruise them. We need long storage, which means no damage. Test for dryness by rolling the garlic neck between finger and thumb. If many bulbs are slippery, slidey, or damp in any way, cancel the shift, try again in a few days. If 90% seem dry enough, proceed, working in the direction they were hung up. Gently remove plants from the netting into a bucket. Do not cut plants off the netting leaving the foliage to drop down the back into Recycling on the floor below. Set up a comfortable place to work, with a bucket of garlic, a compost bucket, a pair of scissors, a ruler and easy access to a green net bag and a red net bag. Some people like to mark off 2”and 2 ½” on the arm of the chair, a nearby wood structure, or their knee. This saves handling the ruler repeatedly. Some people like to move the box fans for more or less fan action while working. Those that do this need to remember to reset the fans to blow on the garlic when they leave. Cut the roots off the garlic into a compost bucket. Cut as close as possible in one or two snips. Cut the tops off the garlic, leaving a ¼ – ½” stub. Cutting too close reduces the storage life. Do not remove any skin. We want long storage not pretty-pretty. Decide if the bulb is dry. Feel the cut neck. The remains of the stem may have a Styrofoam texture. Should not be damp. If damp at all, put the trimmed bulb on a rack to dry further. If more than 10% are damp, cancel the shift or selectively pull dry bulbs from the netting. If not damp, decide if it’s storeable. If damaged, sprung apart or mushy anywhere, put it on the Use First rack. If storeable, decide if it’s seed size and quality. If it could be between 2 and 2 ½”, measure it. If smaller or larger, put in a red bag. It’s for eating. When a bag if full enough (we’re not all Amazons), tie the neck closed and lay the bag down on the floor away from the windows, which let rain in. At the end of the shift, return all scissors and rulers to the jar, take all compost material out, consider doing a Compost Run. Lay down any bags that are more than 1/3 full, as the weight of garlic in a vertical bag can damage the bulbs at the bottom. Leave no garlic in buckets. 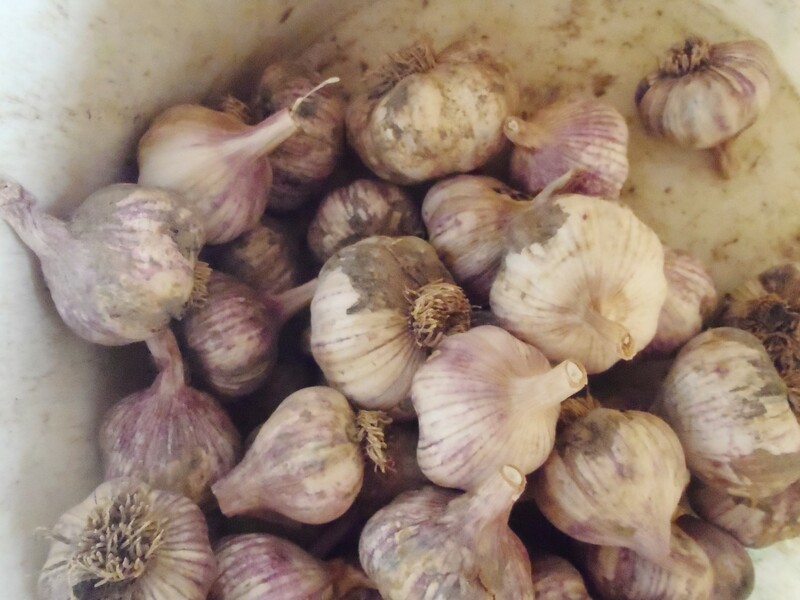 If necessary, gently set garlic on the floor boards, rather than leave it in a sweaty plastic bucket. Make sure no garlic will get rained on if rain blows in the window. Reset fans as needed. Unplug any no longer needed. Remove all hats, water bottles, spare clothing. Periodically weigh the tied off green bags, make neck tags from masking tape, saying “Hardneck Garlic” and the weight. Use the bathroom scales. Weigh a person with and without a bag of garlic. When all the hardneck garlic is dealt with, and not a moment before, record in the log book all the weights of the bags of garlic as you take them downstairs. Take the green bags to the Garden Shed. Lay them on the top central shelf. Take the red bags to the basement and lay them on the shelves in the cage there. Use one side of the cage only, unless you need more space. Weigh the Use First hardneck garlic, record the amount in the log, take the Use First garlic to the kitchen. It does not need to be refrigerated now. 55-70°F is good. When all the hardneck garlic is finished, and removed from the barn, start on the soft neck garlic, if it is dry enough. Do the same as with the hardneck garlic. If possible use purple (eating) and orange (seed) bags, rather than green and red. We need 40 lbs seed. Once we have that, stop measuring. When all is done, weigh, label, record and store the garlic; clean up the mess, return the lawn chairs. Ah, another successful garlic harvest! When temperatures seem likely to drop to below 55°F in the basement, clear the top left shelves in the walk-in and move the eating garlic there. The low shelves near the compressor do not work well. Use the high and dry shelves. 32-39°F is also a good temperature range. Avoid 40-55°F, or the cloves will start to sprout. 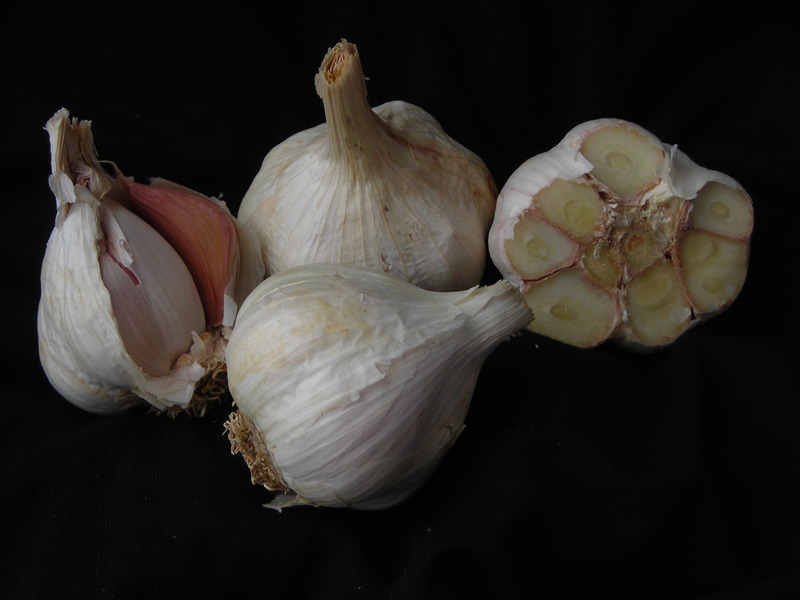 Polish White – our softneck garlic variety.